Actor-turned-director Park Joong-hoon (박중훈) has crafted a highly polished and glitzy directorial debut with Top Star (톱스타). The heavyweight actor – who has hit films including Haeundae (해운대), Radio Star (라디오 스타) and Nowhere To Hide (인정사정 볼 것 없다) in his back catalogue – has clearly exercised his connections within the industry as Top Star features an assortment of high profile names from Korean cinema. Unfortunately however, while there is enjoyment to be had in watching the beautiful faces, lavish lifestyles and celebrity scandals, there is precious little substance beneath the glamour. Director Park has clearly aimed his debut at a broad audience and in doing so he has produced a competent, though unremarkable, film about the nature of stardom. Superstar Won-joon (Kim Min-joon (김민준) has it all – good looks, a career in film and television, an expensive lifestyle, and a beautiful girlfriend named Mi-na (So I-hyeon (소이현). Yet behind all the glitz and glamour, Won-joon is taken care of by an agency, particularly by diligent manager Tae-sik (Eom Tae-woong (엄태웅). 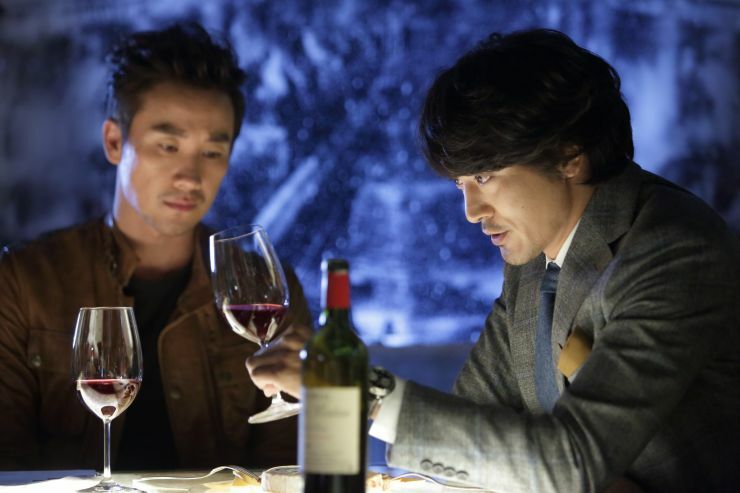 Tae-sik’s adoration of Won-joon leads him to help cover up scandals and, in helping in one case of some magnitude, Tae-sik suffers great personal distress. Stunned by his selflessness, Won-joon grants Tae-sik a sizeable role in his latest television series and is happy to see his ambitions of becoming an actor finally materialize. Yet in discovering fame, Tae-sik begins to change, leading him into a rivalry with Won-joon. One of the great benefits of having a veteran actor step behind the camera for Top Star is that the portrayal of the world of celebrity is convincing. The conversations and behind-the-glamour events clearly come from a person of experience, from discussions in limousines and public-relations meetings to relaxation at home portrayed with insight. Director Park does well in balancing the realms of stardom and downtime, conveying the former as merely attractive but shallow superficiality and working to build character in the latter. It generally works well, although the script routinely employs cliches and contrivances that have been utilised better before, as in 200 Pounds Beauty (미녀는 괴로워). Foregrounded, however, is the rivalry that develops between Tae-sik and Won-joon that occurs in both worlds, which is also where the more interesting events transpire. The initial friendship between Tae-sik and Won-joon is articulated well, as the manager idolises his talent by helping to cover up scandals with no questions asked. Yet the story does become somewhat absurd as Tae-sik suffers a great personal burden in order to provide an alibi for one particular scandal, one that stretches believability almost too far. As Top Star is clearly marketed towards family audiences, director Park omits psychological exploration of Tae-sik’s adoration, yet while it is arguably ‘dark’ material it is depth that is sorely required as the film is so concerned with his unstable personality. Still, sequences in which Won-joon advises Tae-sik on the merits of acting are enjoyable and humourous as their camaraderie deepens on the set of their TV show. Yet just as the story begins to get interesting the film jumps years into the future, bypassing all the fascinating moments that have transpired to trouble their relationship and instead placing audiences in the distressed middle period. As such Top Star loses all momentum, and the film is forced to reestablish itself once more by reintroducing characters and their new situations. It’s an event from which the story never fully recovers and as the film once more sets up events and attempts to take a belated darker tone, they lack the potency they would otherwise have contained. Additionally the (again belated) inclusion of melodrama amongst all the protagonists is horribly cliched and detracts from the viewing experience. One of the major benefits of Top Star‘s second half however is the greater screen time afforded to actress So I-hyeon as TV producer Mi-na. The role is wafer thin and one-dimensional with So I-hyeon very much required to be just a pretty face, although the actress stretches the material as much as she can and is quite charismatic. Yet undermining everything is the manner in which the story wraps up, as it is far too neat and with little – if any – ramifications despite all the wrongdoing. Top Star is great in representing the glitz and glamour of the movie business but, try as it might to explore the nature of celebrity, the film crucially lacks any depth to do so. Top Star (톱스타) is a highly polished and glamourous directorial debut from veteran actor Park Joong-hoon (박중훈). The film attempts to explore the nature of celebrity as a talent manager turned actor desperately works to retain his fame, even creating a rivalry with his idol. As director Park aims Top Star squarely at family audiences however, he doesn’t delve into the psychology of his protagonists resulting in a film that is wonderfully glitzy, but lacking in any real depth.